Hello and welcome to the Tombow + Waffle Flower Crafts Blog Hop! You should have arrived from Jennie Garcia's blog or, if you got lost in the way, you can head to the hop start here. It was super fun to play around with Tombow's products, and they pair so beautifully with Waffle Flower's stamps and dies! Not to mention, a good array of adhesives is simply priceless when it comes to paper crafting. The stars of the show are the gorgeous Doily Square stamp set and the Tombow Dual Brush Pens. I received the Brights set and I couldn't be happier! I started stamping and coloring the square doily and then I trimmed it to form the window for the shaker. On the inside area I stamped a sentiment from Congrats stamp set. The shaker is filled with assorted sequins, microbeads, and a few Tiny Star die cuts that I cut from white cardstock and colored with the Tombow markers. My second project is a tag that uses A Bunch stamp set and Tombow's Adhesive Dots. These are super fun because they're colored! I started with a tag base die cut from Surface - Tag Die - Starter kit. Next, I stamped both the outline and solid daisies from A Bunch set using inks 9, 15 and 16 from the Summer Blend Inkpad. I thought the adhesive dots would be fun to use in the center of the flowers, covered with glitter. The banner sentiment is from the same set. Your next stop is Jennifer Priest. Remember to leave comments on the way because there are prizes up for grabs! Waffle Flower is giving away a Doily Square stamp set and Doily Square die, while Tombow will give away a set of Bright Dual Brush Pens, Tombow Mono Aqua Liquid Glue, Tombow Adhesive Dots and Foam Tape. Thank you so much for hopping with us today! This time, instead of a card, I made a masculine gift bag playing with patterned paper, stamps and dies. And once again, my take on the sketch is very, very free, ha! I started adhering a patterned paper piece to the front of the bag. The Die-namics Cross Stitch Square STAX provided the perfect base for the focal point, where I stamped a sentiment from For the Boys stamp set. The cute bow tie was die cut from Die-namics Terrific Ties and the stitched banner is one of the many awesome dies included in the Die-namics Blueprints 25. Check the Challenge blog for all the details about this week's sketch and to get your fix of inspiration from all the amazing projects from the DT! Thanks for visiting! Stop by the Waffle Flower blog to check all the details about this card and some of my favorite picks for Father's Day! Happy weekend! 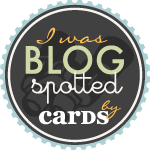 For the background, I used one of my favorite tips for cardmaking. When in doubt, add texture! It always, always, always works. I heat embossed the MFT Woodgrain Background in clear and then sponged ink on the edges. Flowers are from the MSTN Build-able Blooms set and the sentiment comes from LJD For the Boys set. Stop by the challenge blog to check on the amazing inspiration the DT has for you. They blow my mind every single time! Thanks for visiting! Hi everyone! Waffle Flower Crafts and Faber Castell Design memory Craft are having a week long inspiration week and today it's my turn on the Waffle Flower Blog! I'm sharing a project using products from both companies. They work beautifully together! This (mostly) clean and simple girl had a blast getting out of her comfort zone and playing around with mixed media products. Hope you'll stop by to see all the card details... and there's a prize up for grabs too! My interpretation of the sketch was liberal. Very liberal, indeed, so let me explain myself ;) The stems replace the long rectangle and the flower tops were arranged in a slight semicircle to resemble the circle shape from the sketch. See? It may be a free interpretation, but all the sketch elements are in there. I had a blast mixing and matching the elements from the just released Build-able Blooms stamp set and coordinating dies. The stitched card base and green bottom piece (sorry, no idea how to name that shape more accurately) come from Die-namics Blueprints 25 and the sentiment is from For the Boys stamp set. Stop by the Card Challenges blog for all the challenge details and lots of inspiration from the amazing DT! On the SRM Blog Today! Hello friends! It's my turn on the SRM Blog today and I'm sharing a sweet packaging idea for a cash wedding gift. Hope you'll stop by there to see the whole project and details! Happy Thursday!